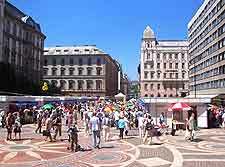 Hungary's proud and often crowded capital city, Budapest is truly unique and endowed with a wealth of remarkable architecture and culture. Divided by the glorious Danube River (Duna), the city of Budapest boasts some spectacular natural scenery, including the westerly Buda Hills and the Great Plain, which lies directly east of the Danube itself. Much of Budapest dates back to the 19th century and retains a strong feel for this era, since it was at this time and during the city's famous industrial boom that the majority of today's city was actually built. Now ranked as nothing short of a 'World-Class City' (Világváros), Budapest has grown to become Hungary's foremost administrative centre, and yet manages to retain endless tourist appeal. 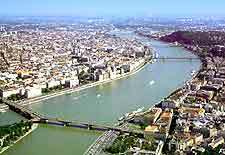 The city actually comprises two main regions, that of Buda and Pest, which were operating as entirely independent cities some 150 years ago. Those lucky enough to spend time in the city will find the best in the way of tourism advice and events information at the Tourinform office, where you can also purchase your Budapest Card (Kártya) and enjoy the possible discounts that it will offer during your stay. When it comes to accommodation, there are plenty of alternatives on both sides of the river. Ranging from chic guesthouses to lively backpackers, there are cheap Budapest hostels scattered throughout the city in excellent proximity to all the attractions and entertainment on offer. There is so much to do in Budapest that tourists will have much to choose from, so do try to plan your time wisely. Families will enjoy spending time at the Vidam Amusement Park, the city's Zoological Gardens, or at the Budapest Planetarium, where the sky shows are extremely enjoyable, whilst imparting much astronomical information. Others prefer to take a boat trip down the River Danube, or enjoy a ride on the steep cog-wheel railway. Music lovers should check the programme of events at the Hungarian State Opera House, where regularly musical performances take place. 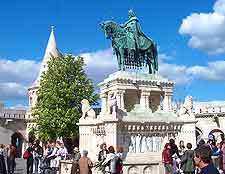 More information about Budapest Tourist Attractions. No trip to Budapest is really complete without first visiting some of this Hungarian capital's most notable sights. The Buda Castle is amongst the most well-known and is also known as the Royal Palace, dominating the area from the top of Castle Hill. Equally impressive is the Hungarian Parliament Building alongside the Danube, and the glorious St. Stephen's Basilica, both of which tie as Budapest's two tallest buildings. Boasting extraordinary views from Gellért Hill, the Citadella is a good place to bring your camera. More information about Budapest Landmarks. Budapest is a city of the arts and boasts many outstanding galleries and also plenty of quality museums. These include the Hungarian National Gallery, the Museum of Applied Arts and also the Museum of Fine Arts, which is housed in a particularly spectacular building which almost overpowers its exhibits. 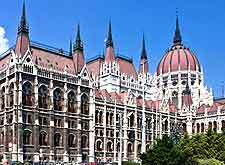 For information about the city's turbulent past, check out the Budapest History Museum and the Hungarian National Museum, another architectural wonder. Highly suitable for families is the Hungarian Natural History Museum, where the life-size woolly mammoth model is always a favourite. 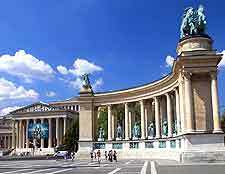 More information about Budapest Museums and Budapest Art Galleries. Try to spend a day or two exploring the Hungary outside of Budapest. Many great tourist destinations are close by and needn't be hard to reach. Particularly close is the fun-filled Aquarena water park, the rather unexpected Statue Park (Szoborpark), and the 18th-century Royal Mansion within the town of Gödöllö. Szentendre may also be of interest, with its Open-Air Ethnographical Museum being the main highlight here. More information about Budapest Attractions Nearby.